The new micropump represents a quantum leap in design of small size high-precison fluid deliverysystems. Injection-molded using extremely durable, but light weight engineered reinforced thermoplastics, the micropump provides ecomical cost with superior performance and precision and ultrafast response/start-stop characteristics. 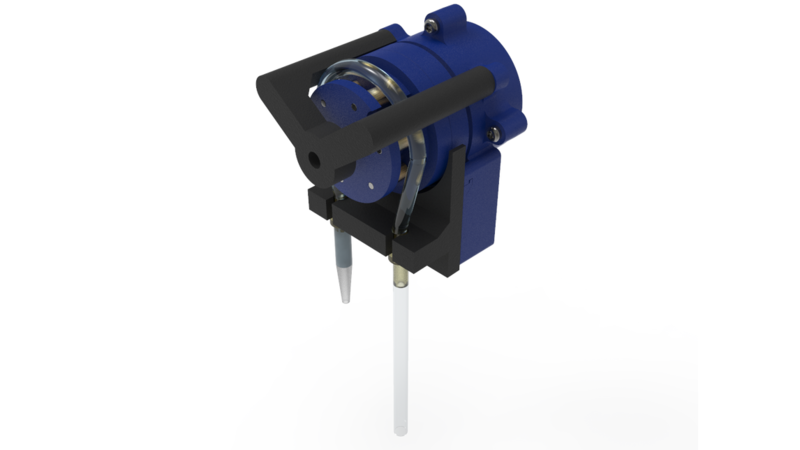 Highly energy efficient, the micropump consumes zero power in hold position. The disadvantages of stepper-based micropump systems have recently been solved by the development of a unique mininature micropump based on a novel piezoelectric motor (piezomotor) technology developed by DTI. At the heart of the new micropump is a precise miniature rotary piezomotor, integrated with an optical encoder (32,000 PPR), that is directly coupled to a peristaltic pump head providing a direct-drive mechanism. The end result is an economical micropump system that eliminates the drawbacks of traditional systems and provides unsurpassed dynamic range of flow rate with ultra-smooth delivery and single nanoliter droplet dispensing capability. The new micropump can be used in micro-injection, micro-suction, rapid sampling, scanning microflow and continuous flow mode applications. Furthermore, the exceptional dynamic properties of the underlying piezoelectric motor enable the micropump to operate precisely at high frequency (i.e. >100 Hz).